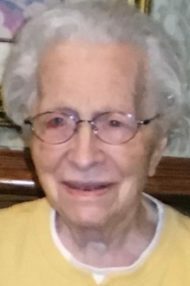 Mildred A. Miller, 103, of Quarryville, passed away on April 11, 2019 at Quarryville Presbyterian Retirement Community. Born in Lancaster, she was the daughter of the late Albert & Florence (Bauman) Fritsch. Mildred had worked as a buyer for Hager’s Dept. Store then Watt & Shand from where she retired. She was a member of St. Philip the Apostle Catholic Church. She previously resided with her nephew, Byron “Barry” M. Becker of Lancaster. She was preceded in death by her siblings: Albert & Erwin Fritsch, Dorothy Danz, Florence Groff and Jane E. Becker. A visitation will be held on Wednesday, April 17, 2019 from 10-11 AM with a Mass of Christian Burial to begin at 11 AM with Rev. Lawrence Sherdel as Celebrant at St. Philip the Apostle Catholic Church, 2111 Millersville Pike, Lancaster, PA 17603. Interment will be at St. Joseph New Catholic Cemetery.